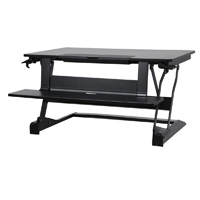 The WorkFit-TLE Sit-Stand Desktop Workstation from Ergotron features a "drop-down" keyboard tray to better accommodate the seated height requirements of users for whom the more common "above desk" retrofit solutions may not be suitable. It combines this with a large 23" D x 37.4" W work surface which includes a convenient integrated tablet/cell phone station with a removable tray cover. For additional convenience it also includes a detachable rear cable tray. 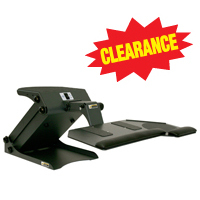 The WorkFit-TLE moves directly up and down so a user is not forced to change position and step back from the desk. The dual releases ensure that accidental movement does not occur. 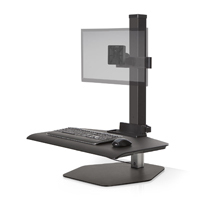 While at first glance the WorkFit-TLE may appear to offer great advantages over other desktop sit-stand retrofit products—because the tray is positioned below the mounting surface—users need to be aware that the distance below the desk surface is only 3.5". While this may work for a limited range of people, assuming a desk surface of 29" this will only position the keyboard tray down to 25.5". This means that it will actually be too high for users under 5'8". 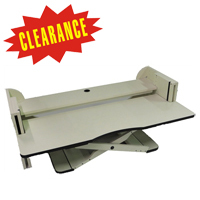 As well, because the tray is positioned below the desk surface the upper range is reduced, with the tray only able to rise 11.5" above the desk mounting surface, offering a suitable standing height for users only up to about 5'7". The shallow depth of the keyboard tray, just 7.9", means that most ergonomic keyboards will not fit or will be limited in the range of adjustment that will be available to users. It also offers limited hand support for mousing, encouraging users to adopt usage modes that may greatly increase the risk of developing RSI. Because the keyboard is positioned a full 8.5" below the monitor mounting surface users may find that their monitors are positioned too high for optimum viewing from a sitting position, especially if they happen to require multifocal eyewear. 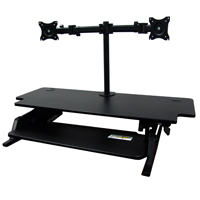 For standing purposes, even with the greater differential between the keyboard and the monitor mounting surfaces, most users will still require some kind of height adjustable monitor mount to further elevate the monitors. Note: Users (above 5'10") may want to consider other options as the lower keyboard position will not provide the necessary range of keyboard height. 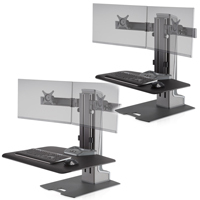 The Volante HD42 Desktop Sit-Stand Workstation from KV Waterloo comes bundled with a sturdy dual-monitor clamp mount monitor arm and can be placed on virtually any fixed-height desk to provide users with an instant dual monitor sit-stand solution. With a 42" wide work surface the HD42 version of the Volante is able to accommodate dual 27" monitors, monitor arms (single or dual), laptops with secondary monitors, or even an Apple iMac. It will fit any desk with a depth equal to or greater than the 23.2" footprint depth. This well-engineered product provides a full 13.8" of height adjustment range. Keyboard height will adjust from roughly 1" to 14.8" above the surface and the upper work surface from 6.2" to 20". A right hand paddle release enables the user to adjust the height to any point throughout the entire lifting range. Gas cylinders provide lift assistance to minimize the effort required to make adjustments and the unique locking system offers infinite adjustment throughout the entire range. Regardless of the height, the Volante HD42 provides a highly stable work surface and keyboard tray, with no detectable wobbling or movement of the mechanism. The cantilever design of the Volante means that as it rises it also moves out and towards the user, requiring them to step back and away to accommodate the new positioning. The upper platform for monitor, tablets, or documents is 42" wide by 15.7" deep while the keyboard and mouse tray is 26.4" wide by 13" deep. The keyboard tray features a tilting mechanism (± 10°) so users can adjust the keyboard inclination to provide for optimal neutral alignment of their wrists. Three 2" grommet holes at the rear of the upper platform can serve as cable guides as well as for attaching a monitor arm should greater elevation be required. The bundled dual monitor arm is a "clamp-mount" that attaches over the rear edge of the worksurface. 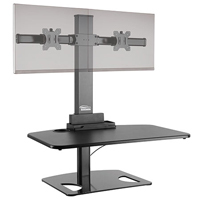 It can elevate the VESA mounting point for the monitors up 16" above the mounting surface. Each monitor mount is equipped with tilt and pan and the 3-section crossbeam also articulates to accommodate a cockpit-style workstation layout. 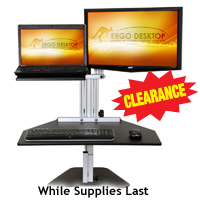 The Freedom Stand Dual from Ergotech Group is a height-adjustable sit-stand add-on unit that converts almost any sit-only desk into a sit-stand desk. 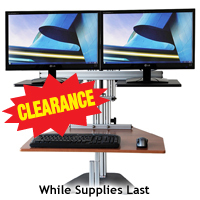 This all-in-one unit will raise a keyboard, mouse, or other desk accessories, including dual monitors, to whatever standing height needed (up to 19.0" above desk height for the keyboard platform; up to almost 42.0" above desk height to the middle of the monitor). The keyboard platform (30" W x 18.8" D) and monitor mount (75x75 or 100x100 mm VESA compatible) move as one unit for height adjustment. * The Freedom Stand uses a heavy metal base to stabilize the unit so that it can be positioned anywhere on the desk surface without having to clamp or bolt it to the desk. Also, there is a release mechanism built into the keyboard platform on the right side, which releases a lock when pressed so that you can then effortlessly move the platform up or down as desired.